Available in multiple colors and designs. 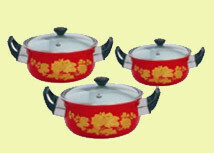 Enjoy the nonstick surfaces of enamel cookware. Line the cupboards with this set of 5 enamel pots. 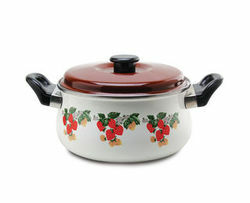 Prepare family meals with enamel stew pots. Cook to perfection and serve each time in an enamel pot. Cook a small meal for two in an enamel pot. Prepare oatmeal, poached eggs and more in it.